Pete the Cat is back!!! In this creative and colorful story, Pete loses his groovy buttons off his favorite shirt one by one. But, it's all good for Pete. He knows that we don't need to cry, he knows that things come and things go, and he just keeps singing his song! In the true Litwin and Dean spirit, we have another guitar-strumming, sing-along book that is repetitive, catchy, and teaches a little lesson too! Here is the book trailer created by HarperCollins Children's Books. If you liked this one, you will love his others too!! All these books have great book trailers and catchy tunes! 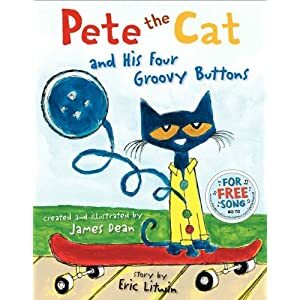 There is even a stuffed Pete the Cat available at Amazon.com. There is downloadable music available at HarperCollins for all these books. On this website, there is more information about the author and illustrator, plus activity guides for each book.